Lechon manok is a roasted whole chicken over live charcoals. Compared to oven roasted chicken, charcoal roasted ones have a distinct smoked flavor and aroma. This is a popular Filipino roasted chicken and there are already many lechon manok food stand selling this. But I think a home made lechon manok will taste better. The preparation of this lechon manok is a little tedious. You have to mix all the spices and herbs in a pot and then boil it. Afterwards you will extract the juice and use a syringe to inject it in the chicken. This will serve as the marinade. Good thing if you already have a charcoal spit rotisserie in your backyard but in case you don’t, you can improvise using a bamboo stick about an inch wide as the spit. Then a large metal basin for putting your live charcoals. Put a piece of metal rod above and center of the basin to support the other end of the bamboo stick (see photo below). 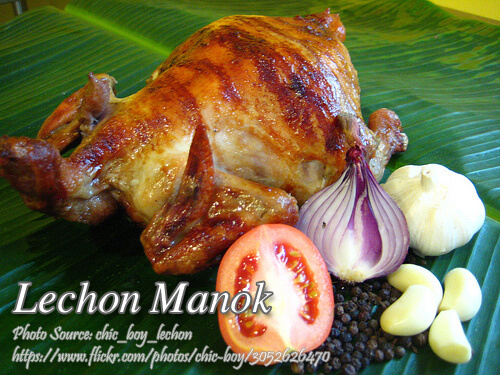 Lechon manok is a roasted whole chicken over live charcoals. Compared to oven roasted chicken, charcoal roasted ones have a distinct smoked flavor and aroma. Put chicken stock in a saucepan and let it simmer. Add the ingredients anise, lemon grass, onion, salt, sugar, garlic and cover. After a few minutes turn off the heat and set aside. Strain the soup stock and reserve the spices. This will be used later to stuff the chicken. Get a big syringe and inject the chicken with the soup stock. Let the chicken marinade overnight in the fridge. 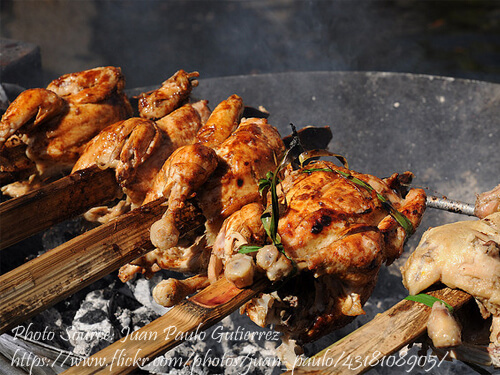 Slowly grill the chicken over the live charcoal and baste with the oil and soup stock mixture. Grilling time will take about 2 to 3 hours depending on the size and weight of the chicken. Chicken is done when clear juice comes out of the chicken when you make a cut on the thigh part. Cook it until the meat is tender and the skin is brown. Serve with lechon manok sauce. Put all the ingredients together in a blender (except the all spice powder) until it becomes a puree . Pour the mixture in a saucepan and simmer for about 15 minutes or until the liver is already cooked and the sauce thickens. Turn off the heat then add the all spice powder. Mix well and set aside. ang sasarap naman ang mag pagkaing niluluto mo kuya . more pwer and GOD BLESS U PO TOGETHER WITH UR LOVING FAMILIES. Thanks and hoping you will visit often and share this site to your friends and families. sorry po,pero confused,lang ako regarding sa(1 cup chicken stock)saan tayo pwd makakuha non. Ang chicken stock po ay sabaw ng nilagang manok. Pwede ring chicken bouillon cubes dissolve in 1 cup of hot water. Kuya Asan na Po yung old recipe mo sa litson manok? Na may lemon grass, ginger vinegar at sugar lang ata yun diba. Na miss ko na Po iyon. Gusto ko I try ulit. Sa pagka alala ko sa basting mo is gumamit ka ng asuete oil at iba pa. Sorry po wala pong ganung recipe dito. Hi, can I use anatto oil to make the chicken look more appetizing? Yes Mirasol, you can baste it while roasting your chicken. Kuya question lang po. How specifically are you injecting the chicken? Or just randomly inject anywhere that is meaty? Hi Vincent, you can randomly inject the chicken where there is meat of course. It doesn’t matter what part but I would suggest the breast part is the best because it is dry. Thanks a lot for sharing always your tasty menu, appreciate it so much. May God bless you always for your unselfishness. Have a good day. Hi Jade, thanks for the kind words. I also appreciate it! Good Day Sir: your blog its such a great advantage & of great help for an aspiring chef like me….. pls continue sharing & more power…thank you!!! Hi Jeff, thanks for the kind words!